Pop quiz: Name a phone with a notch above the screen and a vertical camera array that’s offset to one side on the back. That’s right, it’s the Motorola P30, a midrange handset just released in China. Of course, we didn’t really just mean the Motorola phone when we asked our question — that’s just us being silly. We meant the Xiaomi Mi A2. Or the Vivo V9. Or the Huawei P20 Lite. Or any number of other phones that borrow their design from the Apple iPhone X. Motorola has joined that group, and here’s what we know about the P30 so far. While the Motorola P30 is the first phone to be released, there may be a family of P-series handsets on the way, according to a leak by AndroidPure. The publication.claims the company is working on the P30 Play and a P30 Note phone. While Motorola has only officially announced the P30, all three have been spotted on the company’s website in China, and a smartphone that may be the P30 has been teased through Motorola’s Weibo channel. On the back, there’s a dual-lens camera on one side of the device, with a 16-megapixel primary lens that has an f/1.8 aperture, along with a 5-megapixel secondary lens that has an f/2.2 aperture. The selfie cam is 12-megapixels and has an f/2.0 aperture. Both the front and rear cameras will have A.I.-powered background blur, while the rear camera alone will have A.I.-powered object and location detection. You’ll find a Snapdragon 646 processor on the P30 along with 6GB of RAM. There’s a 64GB and 128GB storage option available, and both allow additional external storage via a micro SD card. A 3,000mAh battery will provide the power. The Motorola website leak showed prices in China of around $300 or $350 for the P30. Less is known about the Motorola P30 Note and P30 Play, but the Weibo teaser indicates a future Motorola phone will have a 5,000mAh battery, which may end up being one of these two phones. The P30 Play is the cheapest of the three, at around $260, so it’s more likely that the P30 Note is the one priced almost identically to the standard P30 in the leak. The P30 Note will likely come in either a 4GB/64GB or 6GB/128GB version. 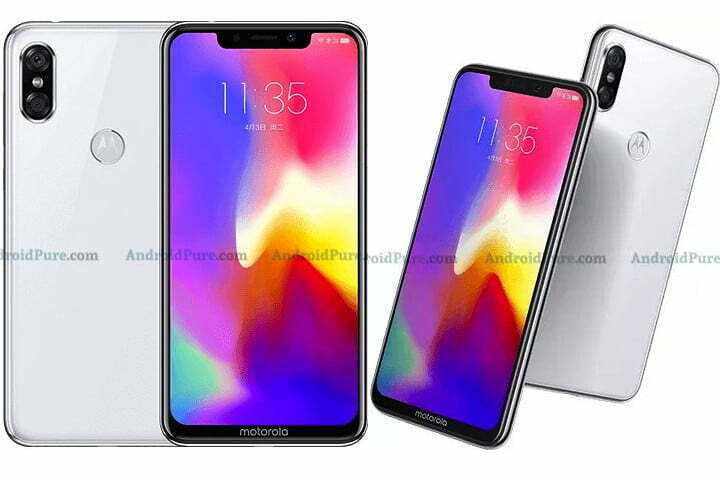 The leaked photos, which appear to be official-looking renders of a mystery Motorola phone, show a small chin at the opposite end of the device’s notched display, along with a smooth rear panel complete with a fingerprint sensor in the top-center. The curved shape of the phone makes it look very similar to the iPhone X. The phone is also reminiscent of another leaked Motorola phone, the Motorola One Power, which was initially rumored to arrive at the beginning of August and have a large 4850mAh battery. It’s possible the One Power may be an international version of one P30 model. Whether the P30 range is the same as the One Power, or they’re all different, remains to be seen. The Motorola P30 officially launched in China on August 15. There’s no word whether the phone will hit the U.S. just yet, but we wouldn’t be surprised to see an international release in the near future. Updated August 15, 2018: The Moto P30 has launched in China. Details have been confirmed and wording has been changed to reflect the release.